On-air challenge: The word "Senses" starts with the letter S, and there are two senses that happen to start with the letter S — sight and smell. I'm going to name some more categories. For each one, name two things in it that start with the first letter of the category. On-air challenge: Given a four-letter word and a six-letter word, rearrange the letters of one of them to get a synonym of the other. For example: Risk, garden --> DANGER. Last week's challenge, from listener Timothy Gotwald of Chambersburg, Pa.: Think of a word that means "entrance." Interchange the second and fourth letters, and you'll get a new word that means "exit." What words are these? Winner: Albert Tumpson of Los Angeles. On-air challenge: Ignore the vowels in each word given. The consonants in each word are the same consonants in the same order as in the name of a well-known American city. Name the cities. For example: DOLLIES ---> DALLAS. Got 2 Words In The Same Category? It's Rhymin' Time! On-air challenge: Every answer consists of two words in the same category that rhyme. For example, two animals whose rhyming names start with B and H are BEAR and HARE. Each clue will give you the initial letters, the words' lengths and the category. Name the things. On-air challenge: Every answer is a five-letter word said twice, in two different meanings. Answer the clues to get the phrases. For example: Device for moving Raggedy Ann and similar toys --> DOLLY DOLLY. 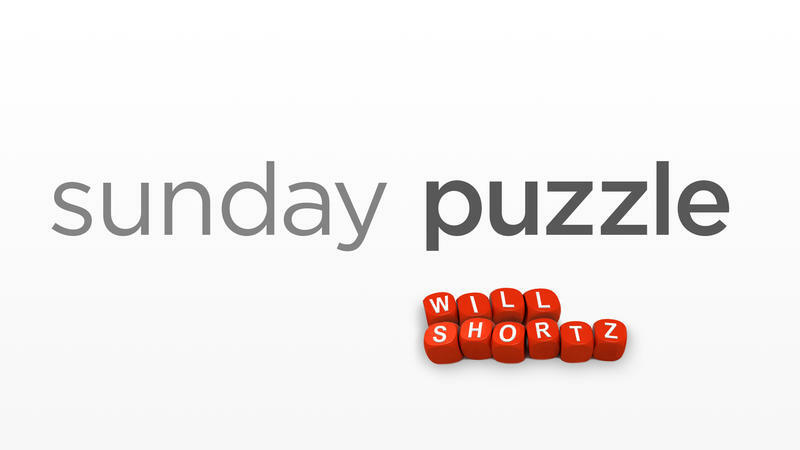 Last week's challenge, from listener Andrew Chaikin of San Francisco: Think of a common nine-letter word that contains five consecutive consonants. Take three consecutive consonants out of these five and replace them with vowels to form another common nine-letter word. What is it? Feeling Puzzled? Just Take An Amble Down D St.
On-air challenge: Every answer is a familiar two-word phrase or name in which the first word ends in -D and the second word starts with ST-. For example: Small red fruit on a vine in the woods --> WILD STRAWBERRY. Last week's challenge, from listener Donna Bass of Lake Forest, Ill.: BAIL, NAIL and MAIL are three four-letter words that differ only by their first letters. And those first letters (B, N and M) happen to be adjacent on a computer keyboard.